A loan of $1,225 helped to prepare his agricultural terrain to increase the yield of his next crop. Aquelino is a working man of 38 who lives together with his partner in the rural locality of Chuñuhuayo, which is located in Morquegua. He has made a living in agricultural work for more than 14 years. He currently works as an agricultural worker and also makes a living in agriculture and in the raising of organic cattle. He always puts a lot of attention in the care and the food that he offers them, which consists mostly of the organic alfalfa he cultivates. He is asking for a microloan so as to be able to prepare his agricultural terrain, fertilizing it with organic material, eliminating the weeds, etc., so as to be able to increase the yield of his next crop. In the future, he hopes to improve the living conditions and his family and count on a greater number of cattle. 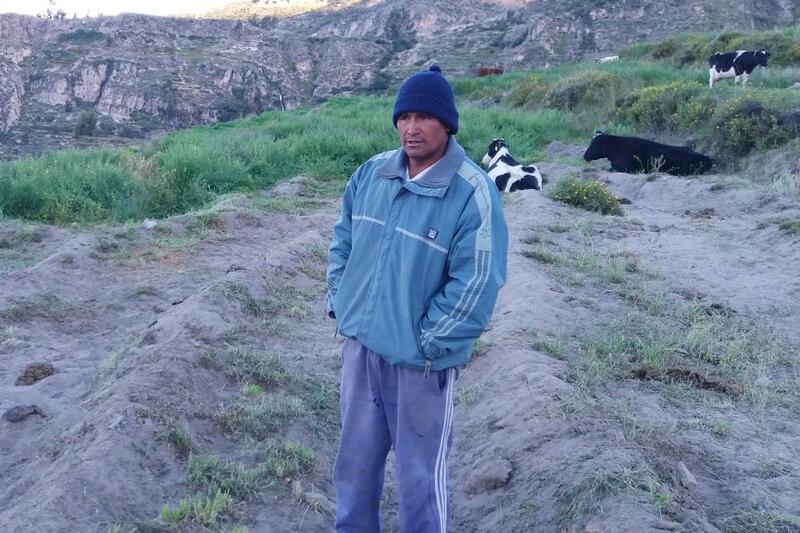 Aquelino es un hombre trabajador de 38 años que vive junto a su pareja en la localidad rural de Chuñuhuayo, que está ubicada en Moquegua. Él se ha dedicado a labores agrícolas por más de 14 años, actualmente trabaja como obrero agrícola y también se dedica a la agricultura y a la cría de ganado vacuno orgánico, poniendo siempre mucha atención en el cuidado y en la alimentación que les brinda, constituida sobretodo por la alfalfa orgánica que cultiva. Solicita el micro crédito para poder preparar su terreno agrícola, abonándolo con materia orgánica, eliminando la maleza, etc., para así aumentar el rendimiento de su próximo cultivo. En el futuro espera poder mejorar las condiciones de vida de su familia y contar con mayor cantidad de ganado. It focuses on environmental sustainability. Fondesurco uses this loan theme to finance local farmers who grow organic crops mainly for export. Fondesurco has a strong environmental focus, and is committed to supporting environmentally friendly farming practices.